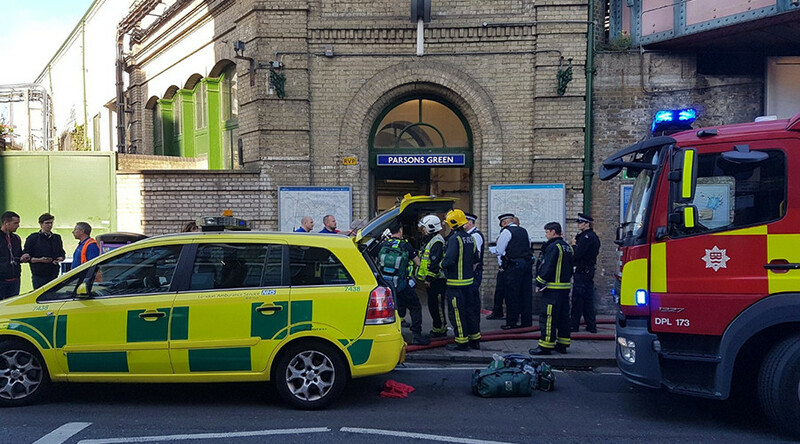 Witnesses at London’s Parsons Green underground train station say a 'fireball flew down the carriage' following an explosion on a District Line carriage on Friday morning. They describe victims with facial burns and people injured in a stampede. Commuters are reporting the explosion stemmed from a fire in a bucket, although the contents of the bucket are not known. Images circulating on social media show what appears to be a burning bucket inside a shopping bag on the floor of the train. RT.com has not been able to verify these reports. An eyewitness told Reuters that flames engulfed one carriage forcing passengers to trample others as they rushed for an exit. The man said people were trampled as they fled. He said he did not hear a bang. The train was packed with people, he added. Commuter Peter Crowley tweeted pictures of his head, which had been burned in the explosion. BBC London presenter Riz Lateef, who was at Parsons Green on her way in to work, said: "There was panic as people rushed from the train, hearing what appeared to be an explosion"
Another eyewitness called Luke told BBC Radio 5 Live there appeared to be "a sort of loud explosion." "It happened just as we were pulling up to the Tube station so everyone just sort of piled out of the Tube and there was a distinct smell of burning." "I certainly saw some burning injuries." "Everyone behaved in the right manner as such, everyone got off as quickly as they can and you know supported everyone." Another witness called Emma also told the BBC: "We were running down the stairs like. It felt like for our lives. Like sprinting, so happy I was wearing trainers. "And I went down the stairs and after a while people were just piling on top of each other, because people were falling over trying to run so quickly. "And there were two ladies underneath me and a little boy to my right, his head had been smacked into the concrete." It is not yet clear whether the incident is terrorism related. Britain has suffered four attacks blamed on terrorists so far this year which killed 36 people.